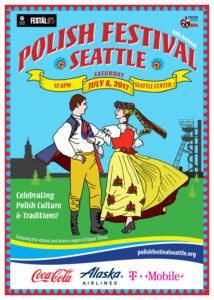 Polish Festival Seattle almost here! Posted by Gail Wodzin on June 17, 2017 Comments Off on Polish Festival Seattle almost here! Saturday, July 8th at Seattle Center, free admission. For the 5th year in a row SGSCA is proud to sponsor the Discover Poland booth. Be sure to stop by and spin the wheel for prizes! $10 gets you 3 tastes: Vodka, Zubrowska, and Krupnik! Plus an assortment of hors d’oeuvres. 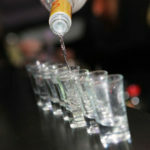 Stop by and visit us – besides vodka there will be music, movie trailers, and photo display of past film festivals! It was a great week for the 23rd Annual Seattle Polish Film Festival. We opened with a complimentary screening of a Polish cult comedy called “Sexmission” at Northwest Film Forum. 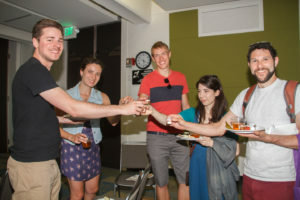 About 50 guests enjoyed light snacks prepared by the Seattle Gdynia Sister City Association, producers of this annual event. Next up was our first ever “Vodka and a Drop of Art” featuring 30+ vintage Polish posters and of course, vodka! Friday, Saturday and Sunday featured some great films including “Gods” the true story of Dr. Religa, the surgeon who performed the first successful heart transplant in Poland. The festival continues thru October 18, 2015. Hope to see you there!